ABU DHABI, 12th February, 2018 (WAM) -- Held under the patronage of H.H. 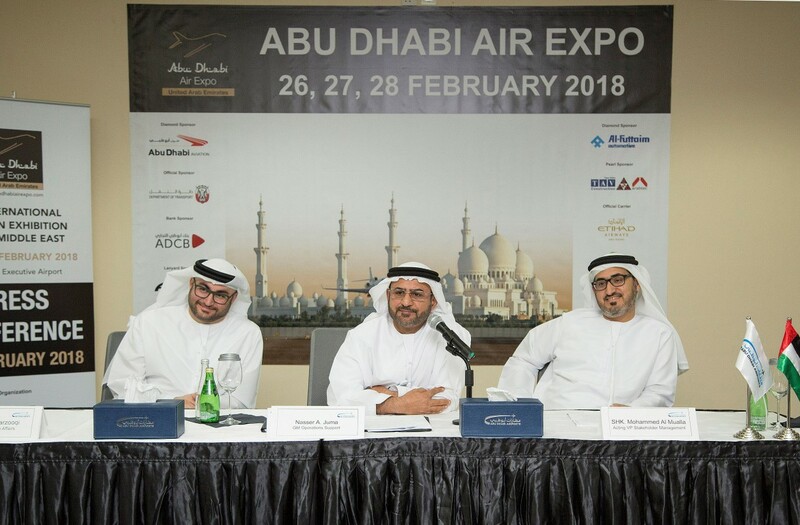 Sheikh Hazza bin Zayed Al Nahyan, Deputy Chairman of Abu Dhabi Executive Council, the Abu Dhabi Air Expo 2018 hosted a press conference on Monday announcing the prestigious line up of sponsors for its fifth edition, set to take place from 26th to 28th, February, 2018, at Al Bateen Executive Airport, the first dedicated business aviation airport in the region. 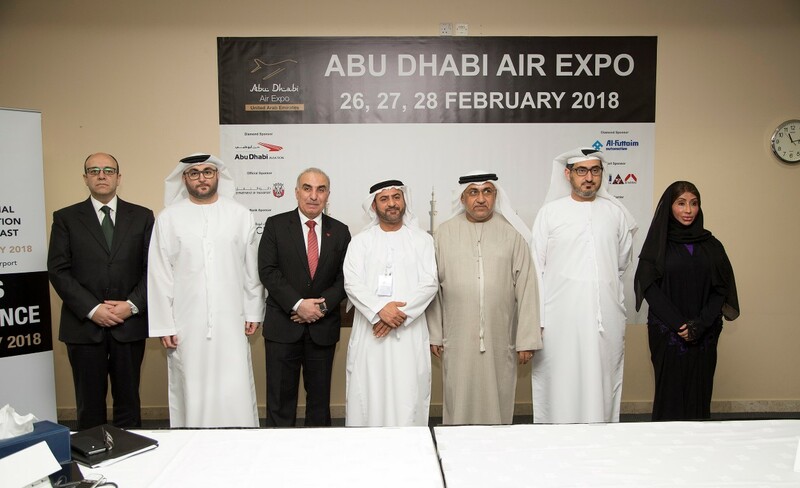 Abu Dhabi Aviation will return as diamond sponsor of the biggest aviation event in the capital, alongside Al Futtaim Automotive that has also chosen the diamond ranking. Etihad Airways is the official carrier and the Department of Transport is the official sponsor for the event this year. Etisalat will be the expo’s official telecom service provider while Abu Dhabi Commercial Bank, ADCB, will be the official bank. Atlas Security and TAV-CCC-Arabtec joint venture will be joining the show as Pearl Sponsors and Profire Security Consultants as the Support Sponsor. With such a strong support from key entities, the show is poised to be a major step for Abu Dhabi as the emirate continues to transition into a diversified aviation hub in line with the Abu Dhabi Economic Vision 2030. Nasser Juma, Acting General Manager of General Aviation Airports at Abu Dhabi Airports and the Chairman of the Abu Dhabi Air Expo Organising Committee, said, "We are very excited to organise and host Abu Dhabi Air Expo in its fifth cycle, as the continuity of this event confirms the position the emirate of Abu Dhabi and Al Bateen Executive Airport have acquired as the key regional capital for general aviation. Air Expo is a dedicated platform where industry leaders, tradesmen, clients, hobbyists and the public can engage and gain insight, business leads and develop opportunities that will benefit both the end user and the entire industry." In addition, the Abu Dhabi Air Expo will serve as the venue of choice for Gulfstream. They will display their highly-anticipated G500 aircraft for the first time in the Middle East and Africa region. "Abu Dhabi Airports is honoured that Gulfstream has chosen Abu Dhabi Air Expo as the platform from which to debut its latest aircraft, as it indicates that this symposium is a key opportunity for world-leading aviation companies to demonstrate their expertise and latest innovations. Abu Dhabi Airports is glad to provide an efficient platform for aviation leaders to engage in dialogue with potential partners, which enables growth of businesses and an exchange of experience and knowledge," he added. The three-day event is set to welcome over 18,000 visitors from the aviation and aerospace industries. An exhibitor line up of more than 300 manufacturers and suppliers will showcase the latest innovations and developments in private jet aircraft, helicopters, executive charter services, airport equipment and services, avionics systems, insurance and financing.